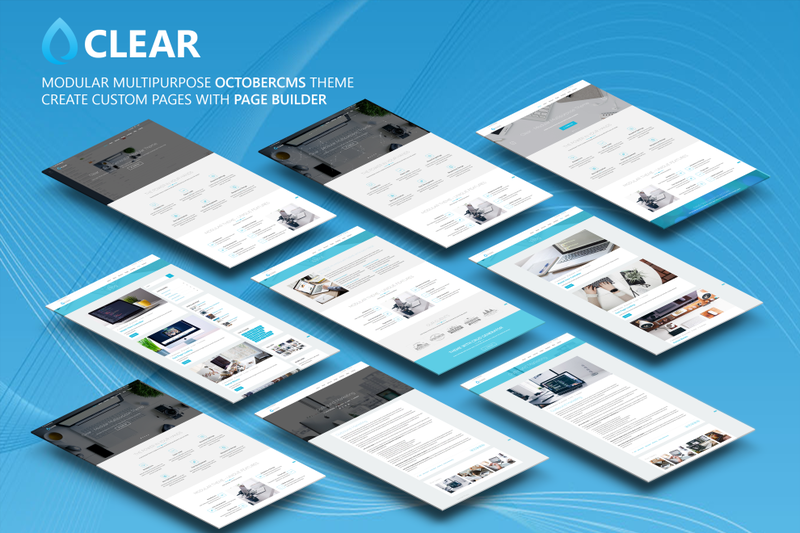 Clear - Modular Multipurpose Octobercms Theme with powerful Theme Settings and an Page Builder system. CRUD Generator - Page builder system for easy page creation. 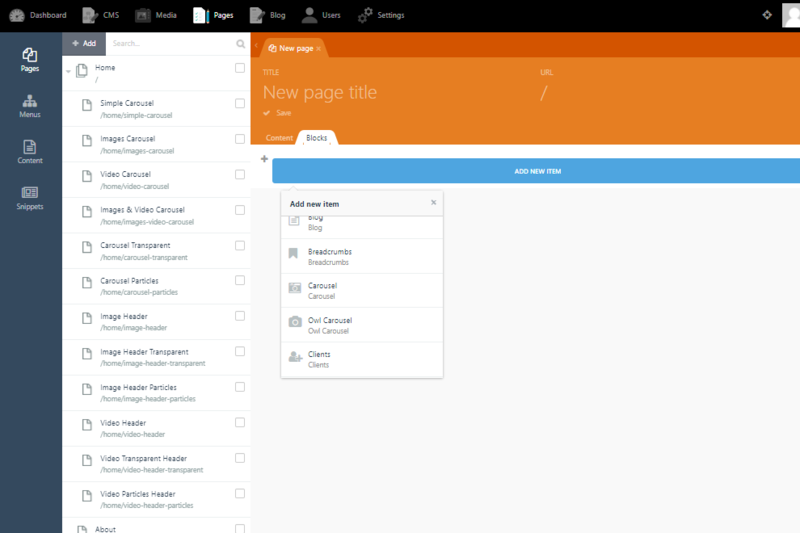 You can create Carousels, Tabs, Pricing Tables, Galleries, Progress Bars, Services, Features, Contact, Subscribe, Maps and more! Blog special settings with 2 blog post style types. Blog Next & Prev Blog Post Navigation, Post Gallery, Similar Posts, Comments. Enable/Disable Sidebar Widgets. Footer Options with Contact Info Fields and Subscribe text. Carousel Section Block. Create Bootstrap 4 Carousel with Unlimited Slides. Owl Carousel Section Block.Create Owl Carousel with Unlimited Image & Video Slides. Header Image Section Block. Create Image Header with Parallax Effect. Header Video Section Block. Create Video Header. Portfolio Section Block. Create Images & Video Portfolio with Category Filter and Magnific Popup. Services Section Block. Create Unlimited Services. Features Section Block. Create Unlimited Features with Main Image. Facts Section Block. Create Section with your Facts Animated Numbers and Image Parallax Effect. Prices Section Block. Create your Prices Tables. Skills Section Block. Create Section with your Skills with Custom Progressive Bars. Tabs Section Block. Create Bootstrap 4 Tabs with Main Image. Skills & Tabs Section Block. Create Tabs ans Skills to One Section. Testimonials Section Block. Create a Testimonial Section with Owl Carousel. Clients Section Block. Create a Clients Section with Owl Carousel. Banner Section Block. Create a Section with your Text and Image Background with Parallax Effect. Video Section Block. Create a Section with Video Background of your Choice and a Video Popup. Team Section Block. Create your Team Section. Blog Section Block. Create a Blog Section with 3 latest Posts. Contact Us Section Block. Create Contact Us Section. Contact Info Section Block. Create Address, Working Hours and Social Information. Map Section Block. Create a Map Section entering your Address. Page Header Section Block. Create a Pageheader Section. Subscribe Section Block. Create a Subscribe Section. Breadcrumbs Section Block. Create a Breadcrumbs Section. CRUD Generator System that help you Create, Modify, Update or Delete Fields inside Blocks. A Page Builder system with 26 Premade Blocks that lets you create Unlimited Custom Pages. Blog Featured Images Enhancement. If you upload more than one Images to a Blog Post, an image Carousel Automatically Created on Post Image place. One other Carousel is Created after the Post. Special Layout Settings for your Blog and Blog Post Pages. You can choose Right Sidebar, Left Sidebar or No Sidebar. You can choose Main Area and Sidebar Width. Container Type. You can choose Container or Fluid Container with your own container width. Special Blog Post Settings. Choose between 2 Blog Post Types. Enable Transparent Header on Post. Enable Next & Prev Post Navigation, Gallery, Similar Posts and Comments. You Can Enable or Disable Sidebar Widgets. 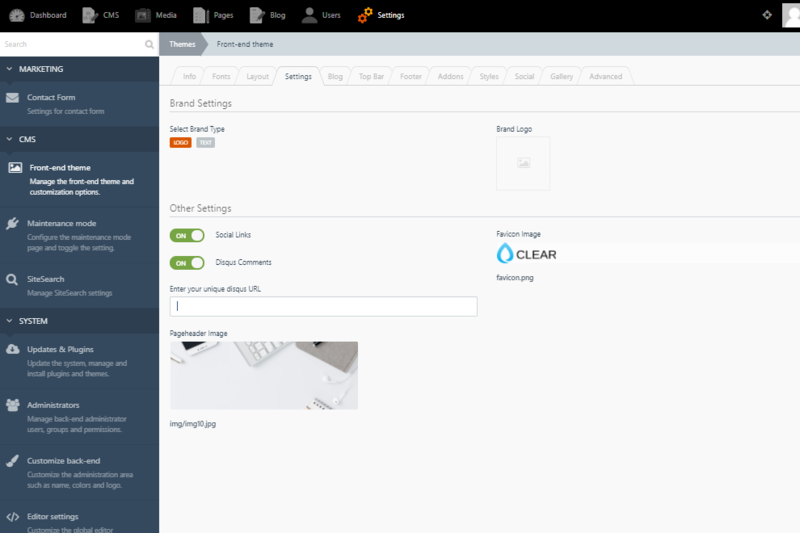 Clear Theme automatically installs the required plugins, but if something go wrong you can install them manually. Create at least one more language. If you have only one language installed, Page builder will not work! Go to Layouts (Default & Static) -> Components -> Translate -> Locale Picker (just click it, do not throw it to layout) and then save. Now you have language selector on all pages! Good email support (I'm new to Octobercms) and full of interesting features. Great piece of software! Great theme but Google PageSpeed Insights shows not very good results. I hope this will be improved in the next versions. Thanks. Great job. All that is needed for a quick and beautiful site deployment. Theme setting is quite flexible, and at the level of beginners, also for those who understand code. We've found Charis's set of themes brilliant. We're really looking forward to the watching them develop. To us, Charis has spotted a way of expressing the extreme flexibility of the CMS / Page Builder architecture by building on top of Samuel and Alexey's superbly simple architecture. We've hit the odd minor issue with misunderstandings on our part but any confusions have been quickly settled - see the forum! Thank you very much Mike and Stephie MacDonald! 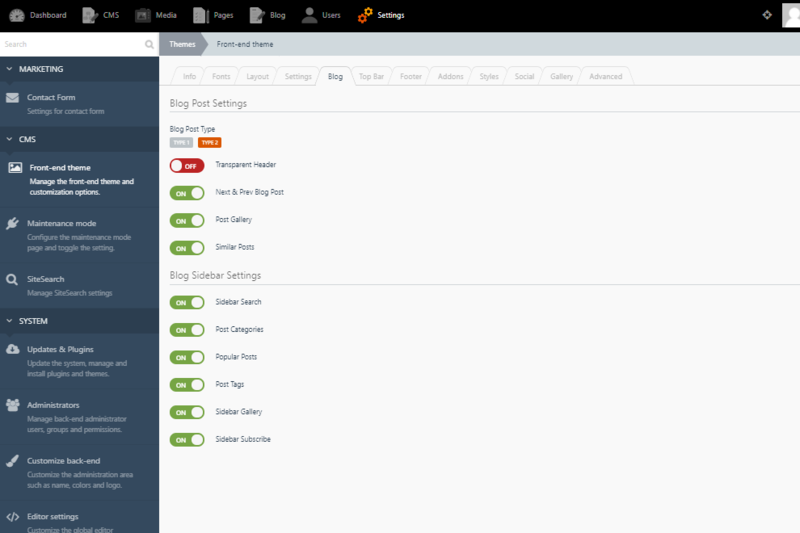 Is true that Octobercms offers many features for user-friendly themes. So stay tuned for even more possibilities! Thank you very much Nora! I'm glad the theme has covered your needs. Really appreciate it. Convert Map block language and region dropdown fields to text for better support. Fixed css transition on main menu. Fixed blog categories pagination issue. Removed unnecessary padding on page layout. Added feature. Now you can have transparent menu without topbar. Fixed Font Changer on theme settings. Added option to hide Portfolio filter. Added possibility to use Url links instead of Popup on Portfolio Section block. Fix tabs block code. Now you can use multiple tabs and tabs skills on same page without issues.